Thought After Thought – To be human in public. Charles Dana Gibson, in the late 19th and early 20th century in the United States and Canada, portrayed a feminine ideal of physical attractiveness in her pen-and-ink illustrations. The artist saw his creation as representing the composite of “thousands of American girls”. The Gibson Girl instantly changed–and challenged–the standard feminine image. These women were free-spirited, fierce, were emboldened by the suffragists and most of all, rose above the traditional gender roles of that time. This New Woman sought independence from conventional femininity and wanted to create their own identity. The Gibson Girl was considered an upper-class lady up-to-date with the latest fashion trends, venturing outside her social circle, being adventurous, all that was not expected from a 20th-century upper-class lady. She had an athletic figure; she was tall, had a slender neck, full lips, large hips and a full bust which added to her seductiveness. She would usually wear the new fashion trend she introduced: a swan bill corset (s-curve torso). She wore her hair piled high in a pompadour or chignon (waterfall of curls). The Gibson Girl was poised and traditional, but she considered herself to be equal if not above the men. They were sexually dominant in a teasing, breezy manner, very picky about men and crushing them ruthlessly when necessary. All men admired The Gibson Girl, followed her everywhere and were drawn to their irresistible charm. Gibson Girls examining a man under a magnifying glass. Charles Dana’s illustrations made women want to live up to the idolized image. One of the first women to have posed for these illustrations was Gibson’s wife, Irene Langhorne. The most famous of his models were the actress Camille Clifford and the supermodel of the day, Evelyn Nesbit. Their images appeared in the magazines Scribner’s, Harper’s, Collier’s, and The Century, invading popular culture. Merchandise like ashtrays, pillow cases, souvenirs, saucers, fans, etc. also carried their images. Sneakers are shoes that were primarily designed for sports or other forms of physical exercise, but which are now also often used for everyday wear. It’s generally described as shoes with a flexible sole made of rubber or synthetic material and an upper part made of leather or synthetic materials. From using sneakers for physical exercises only, we have reached an era where they have become a part of the popular culture and a time where every single person has at least one pair. The world has gone from certain signature brands of sneakers to almost every brand making their own designs, even the high-end fashion designers like Gucci and Prada. 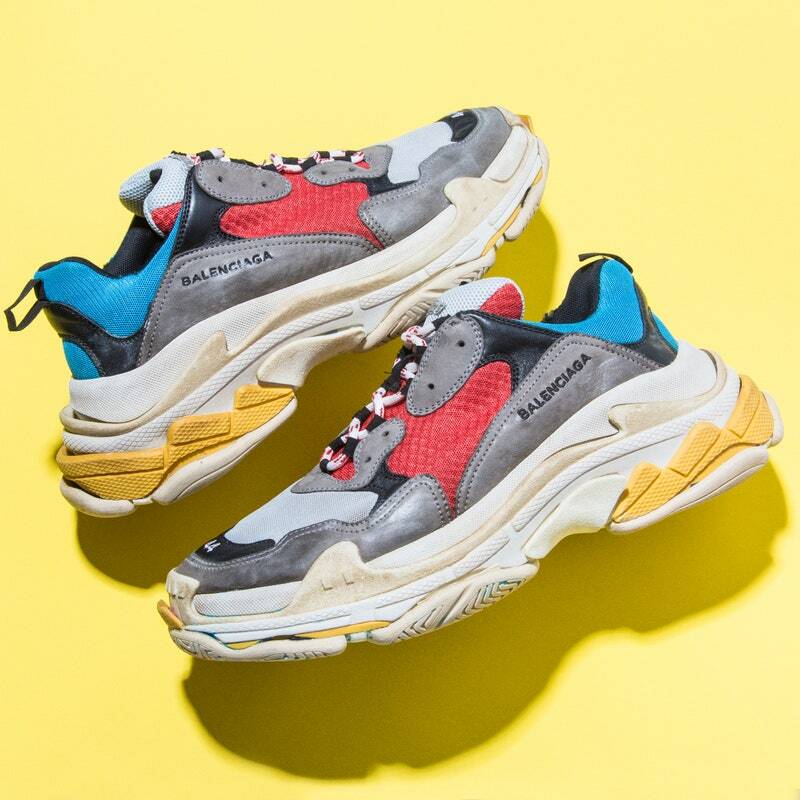 The most recent sneaker trend that has come into being is ‘Dad Sneakers’ as they’re being called, which began with Balenciaga’s release of “Triple S” sneakers on September 16, 2017. These shoes have exaggerated soles, bulky uppers and ‘chunky’ silhouettes. Another sneaker sensation that took over the world was the Adidas Yeezy Boost which was the much-awaited collaboration between Adidas and Kanye West. The first collection released on February 14, 2015, in 4 colorways. In December of 2017, it released 19 colorways and 6 designs. 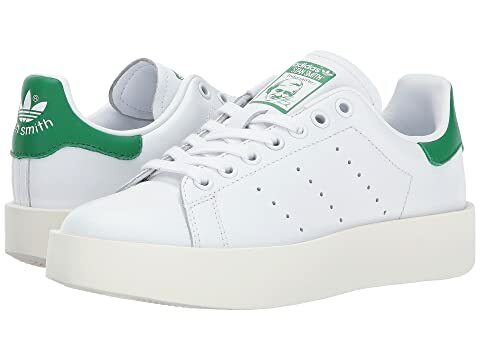 In 2014, Adidas relaunched its classic Stan Smith collection that originally began in 1973 when the brand approached American tennis player Stan Smith to endorse their Haillet (French international tennis player) shoe. The relaunch came with the option for customization, color choices and the chance to get your name embossed on the shoes. There also came a period where sneakers played a huge part in making political statements and for bringing about social change. In 2013, Brazilian architect Oscar Niemeyer designed shoes for Converse in which he put hidden human rights slogans and symbols. Artist Jimm Lasser custom-designed Nike’s famous Air Force 1 sneakers into “Obama Force One” in 2008, in which he etched profile portraits of President Obama on each sole. The growing popularity and prices of sneakers had also brought a hit of crime wave upon the world. Artist Judi Werthein designed the 2005 Brinco cross-trainer to assist with illegal border crossings from Mexico. Werthein distributed Brincos to migrants at the U.S.-Mexico border for free, while also selling them to sneakerheads for $215 per pair at a San Diego boutique. 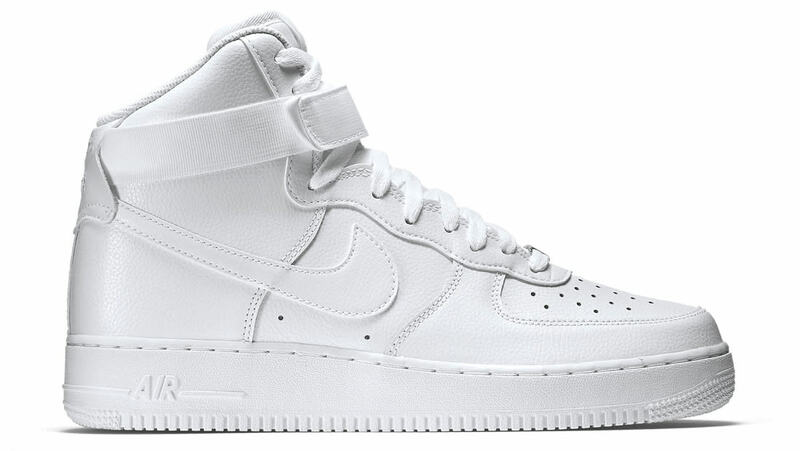 Also in the 1990s, when Nike released Air Force 1 sneaker, it became an instant classic. The rise in the sneakers’ price and social cachet led to a wave of sneaker theft from which these merited the name of ‘felon shoes’. 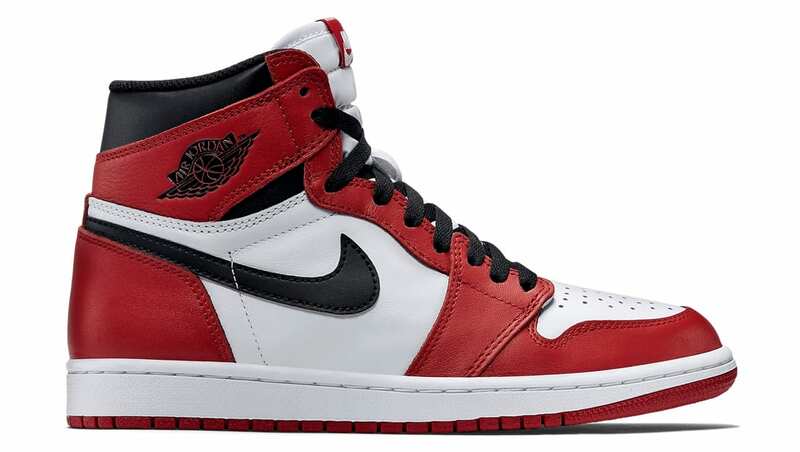 1984 was a big year for Nike as its sales took off with the introduction of a line of basketball shoes in collaboration with a rookie shooting guard on Chicago Bulls, Air Jordan I. The original Jordan’s black and red colorway was against NBA regulation, and every time Michael Jordan stepped onto the court wearing them he was fined five thousand dollars. 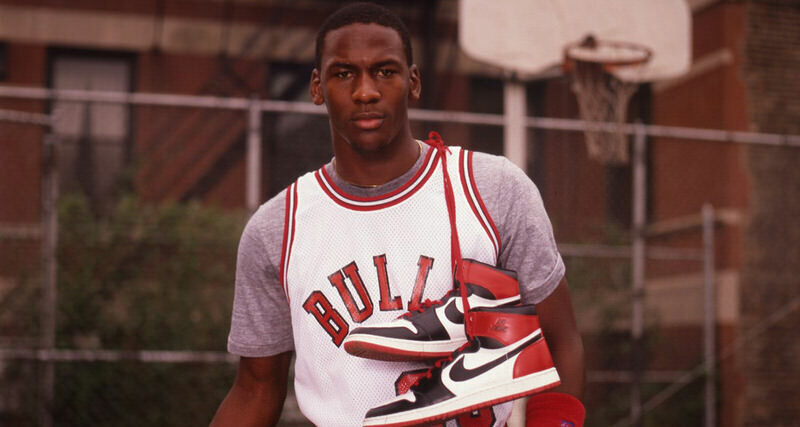 The controversy made the shoes an international sensation and helped establish the sneakerhead culture as a whole. In 1977, Vogue declared that “real runner’s shoes” were status symbols. Many famous celebrities wore them including Mick Jagger and Farrah Fawcett. People didn’t just have one or two pairs of sneakers but wardrobes full of them. Also, New Yorkers in basketball and hip-hop communities changed the perception of sneakers from sports equipment to tools of cultural expression. 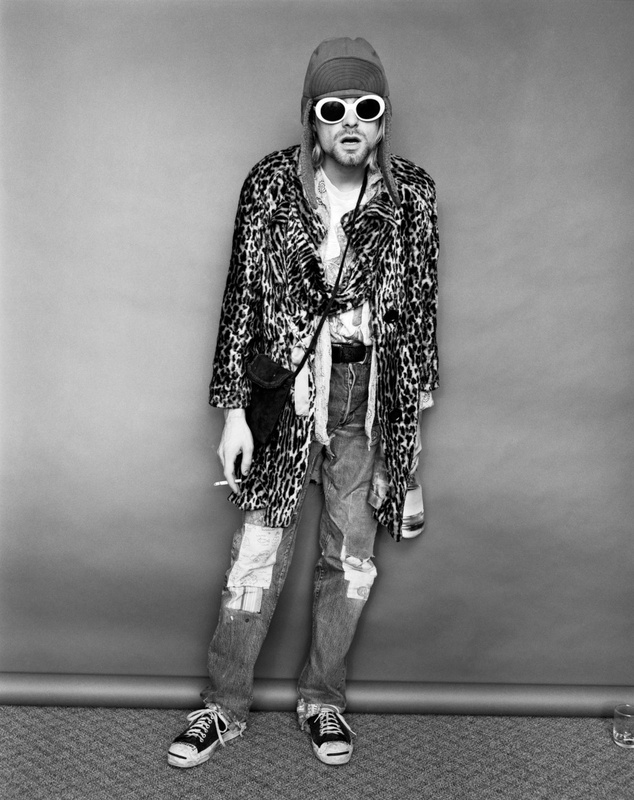 Converse, Keds, and Vans got street cred, not from sports stars but Ramones, Sid Vicious, and Kurt Cobain. When launched in 1968, the PUMA Suede trainer was well ahead of the game. Its thick, rubber sole and rounded silhouette crafted in tough suede stepped away from the typical status quo of canvas and leather-based shoes. The year of its birth, the Suede bore witness to one of the most recognizable moments in Olympic history. 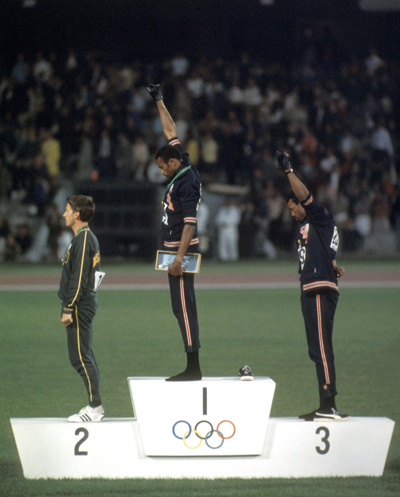 200m gold and bronze medallists Tommie Smith and John Carlos were on the podium after receiving their medals when the American national anthem played and they made their now infamous human rights salute (often referred to now as “The 1968 Olympics Black Power salute”). The Suedes were alongside the two shoeless men, carving its own special place in this historic moment. These two weeks, we had to do further research on the object of our choice and finally write a 500-word essay based on the same along with attached images. We were also given an interesting task of putting the information about the same object as a caption for Instagram (50 words) along with the image and a Tweet (240 characters). 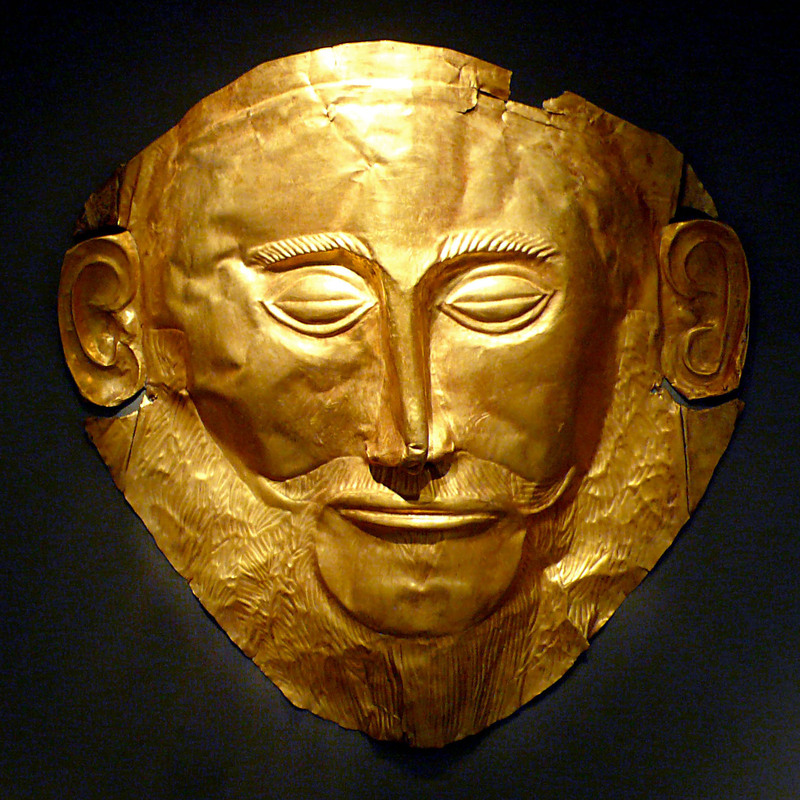 The Mask of Agamemnon is a gold funeral mask discovered at the ancient Greek site of Mycenae. The mask is displayed in the National Archaeological Museum of Athens. The mask is one of five discovered in the royal shaft graves at Mycenae. In a telegram sent to King George of Greece, Schliemann proudly declared: “With great joy I announce to Your Majesty that I have discovered the tombs which the tradition proclaimed by Pausanias indicates to be the graves of Agamemnon, Cassandra, Eurymedon and their companions, all slain at a banquet by Clytemnestra and her lover Aegisthus.” Schliemann claimed that one of the remains belonged to Agamemnon himself, hence the gold mask on his face was called the ‘Mask of Agamemnon’. According to Schliemann’s interpretation of Pausanias, Agamemnon was buried within the walls of the Bronze Age citadel. This ran contrary to the interpretation of previous scholars, who believed that the tombs were outside the walls of the city. In 1874, tests conducted by Schliemann inside the wall revealed house walls, a tombstone, and some terracotta artifacts. This meant that the site had the potential for future investigation. Schliemann’s excavation of the shaft graves revealed that they contained the remains of several Mycenaean chiefs, five of whom wore gold face masks. The mask was a death mask and made of a thick sheet of gold hammered against a wooden background. A sharp tool was used later to chisel the finer details. The mask is said to depict the face of a man with “an oblong face, wide forehead, long fine nose, and tightly closed thin lips.” The details of the eyebrows, mustache and beard were indicated. Near the ears, two holes were made so that the mask could be held over the deceased’s face with twine. Of the five gold masks, this was the only mask showing a bearded man, hence Schliemann’s conclusion that it had belonged to Agamemnon. The faces and hands of two children in Grave III are covered with gold leaf, one covering having holes for the eyes. The mask was designed to be a funeral mask covered in gold. The quantities of gold and carefully worked artifacts indicate honor, wealth and status. Modern research, however, has actually dated the mask to about 1550-1500 BCE, which is three-hundred years before Agamemnon, if he did exist, would have lived. Much controversy has come up regarding the identity of the mask with many people calling Schliemann a fraud. Nonetheless, not all bodies were buried with such riches and the mask still indicates that it covered somebody of some sort of importance, presumably some other Mycenaean king. The Mask of Agamemnon is one of the five gold funeral masks made by hammering a sheet of gold and then chiseling the finer details. It was discovered by Heinrich Schliemann in 1876 at the ancient Greek site of Mycenae. Agamemnon was the king who led the Greek forces during the Trojan War. Mask of Agamemnon discovered by Heinrich Schliemann in 1876, is said to be of the Mycenaen king who led the Greeks in the Trojan war. It is a funeral mask made of a sheet of gold that is hammered and then chiseled. The quantities of gold indicate wealth, honor and status. These two weeks we had the task to select any one historic object displayed in any museum across the world. We then had to research about that object based on the guidelines provided by Prof. Poulomi Das. Personally, I have always been fascinated by Greek mythology and history. Hence, my pick was the “Mask of Agamemnon” displayed at the National Archaeological Museum of Athens, Greece. The mask was a death mask and made of a thick sheet of gold hammered against a wooden background. A sharp tool was used later to chisel the finer details. The mask is said to depict the face of a man with “an oblong face, wide forehead, long fine nose, and tightly closed thin lips.” The details of the eyebrows, mustache, and beard were indicated. Near the ears, two holes were made so that the mask could be held over the deceased’s face with twine. Of the five gold masks, this was the only mask showing a bearded man, hence Schliemann’s conclusion that it had belonged to Agamemnon. The faces and hands of two children in Grave III are covered with gold leaf, one covering having holes for the eyes. The mask was designed to be a funeral mask covered in gold. The quantities of gold and carefully worked artifacts indicate honor, wealth and status. Before the first class, all of us had an idea in our head about what the subject entailed and what we would learn this semester. Most of the class thought that the class was all about how objects have evolved through history or how objects define history. I personally thought that every object tells a story of the time period and place it is found in. The first class was about interacting and understanding what the course is about and how we were going to learn about important objects in history. But before getting into the details it was important to understand what exactly is an “object”. There was a lively discussion regarding this and everyone had varied answers and reasons to believe in that definition. Then we went on to making an attempt to connect the objects to history and seeing their importance in that time period. We discussed how all objects have certain qualities like no other and these qualities might be made on purpose or inflicted over the years due to climatic conditions or poor management. There was also a discussion about how certain histories are often exaggerated over hundreds of years. A wrong story once started, keeps turning bigger and bigger as generations pile on and soon is mistaken as a legitimate part of the history. Often tour guides at historic sites do such things to attract crowds. We then saw a film about the evolution of human beings over millions of years. It showed us how much man has learned given how primitive he was both in terms of body and mind. Today’s class was all about exploring colour like never before. Starting out with a blank mind, we went on to put our thoughts on paper, no matter how vivid or unusual. The 5 senses and the 4 elements had to kept in mind but you soon forget about it all and paint your heart out. Some of it might not even make sense to you, let alone others. I used a flat brush for one of them and then I got tired of it so I decided to use pieces of cartridge sheets to make swatches of colours. Bodies of water and the sky on paper. For as long as I can remember, I have woken up to the most beautiful sunrises. I have tried to capture every single one of them since I have had a phone. All the tired evenings after a long day, would be spent on the swing in my balcony, looking at the sunset over the river Tapi. And when I say that every sunset that I have seen so far has been awe-inspiring, I mean it – every sunset ever! Every evening I would be sat there wondering, taking pictures and thinking how no two sunsets are the same. No clouds, too many clouds, yellows, sometimes colours so unique , I don’t even know where they come from, literal silver linings and what not. Although a small part of my day, these sunsets made me marvel over how no two things are ever the same, not even twins. Maybe similar but never the same. And how everyday brings a new change in people, places, situations and basically every aspect in life. What aspect of colour gives you joy? I have always found the colour Blue very soothing. It always reminds me of the sea. I have always been attracted to water and I love to swim. Blue is also the skies and what I imagine to be the colour of the mind when it is at peace. While it may be a gloomy colour for some, to me it is the colour of tranquility. When I first heard the question I thought, “No! Why would I fear any colour?” But when I gave it a deeper thought, I felt that I don’t fear any one colour in particular but when I paint or sketch I do fear the possibility that one colour might overpower the others and ruin my hard work. I can’t name the colour because it depends on what you are painting. Whenever I paint I find myself picking the colours very cautiously so as not to choose the wrong colour. What is the colour recollection that I have? When I think about a memory of a colour that is intact in my mind till date is the snow white walls of houses in Greece. This white architecture would always be complimented by bright doors and roofs of the houses. Many houses also had bushes with bright coloured flowers outside their homes. The new term began with a fun class which was actually a movie session where we were shown a French classic Amèlie, from which we were to draw slight inspiration for our upcoming project. Amèlie is shown as a very shy girl who sees the world from unique perspectives. While she makes everyone else’s life better, she struggles to find happiness for herself. After watching the movie the class was divided into groups of 4 for the assignment. This time around the assignment was regarding a market setup. While the previous assignment demanded focus on a small space i.e. the workspace of a street vendor, the new project broadened the possibilities as we now had to study an entire market. We were asked to choose one market as the focus of our study ; we chose Flora Fountain Book Market. We had to document every aspect of the market through photographs, audios and videos. Our first task for this project was to do the mapping of the entire market area and its surroundings on a A0 sheet. We also had to make 25 quick sketches of the market. Our visit to the market was very successful. We brought our cameras with us and captured as many images as we could. We used our phones to take audios and videos of different parts of the market. Through the audios and videos you can hear and see the hustle and bustle of people in the market area. You will also see and hear traffic on the roads. We also talked to the shopkeepers regarding their stock, variety and problems. As we entered the class we were asked to get on with our presentations, whatever form they were in. All write ups, illustrations and posters had to be put on the boards while the models and installations went on the table. The presentation had to be neat and precise in every way. The text had to be given the utmost importance.